Today was our first day with some travel challenges, but in the end, we were all extremely happy with the results. There was a lot on our plate today, so we had hoped to shove off by 8:00 from Custer. We left at 10:00. However, that did include a trip into town and the little grocery store for some essentials. Stephanie loved this grocery store. She said it reminded her of the grocery store in Haskell that she would go to with her Meema. A very nice gentleman who worked there carried our bags out to the car and then went back inside to grab the ice we purchased. Stephanie sent Mallory back in with some money to tip him, but he refused and said he couldn’t take it. While all this was happening, Miles and I were across the street browsing some souvenir shops. I had asked the desk clerk at the hotel a question about a different route up to Deadwood than the same ol’ road we’ve been driving. She suggested a route that takes you right up through the Black Hills, and some of it is on unpaved roads. She said the roads were great and there is hardly anybody on the road. Sounded great to us, so off we went. This is where the changes in our day first started taking shape. 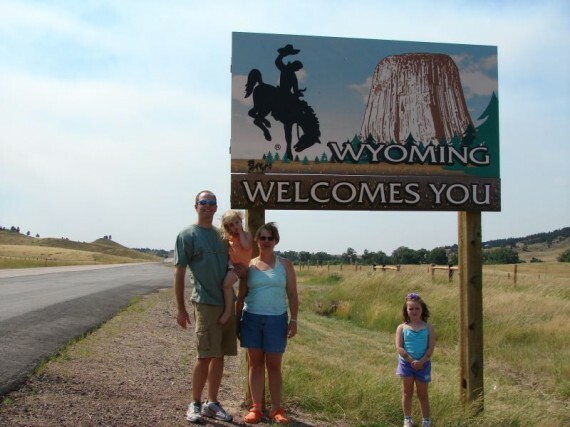 Our ultimate plan was to drive north to Deadwood/Sturgis, then over to Belle Fourche to see the Geographic Center of the US, then over to Devils Tower. We had reservations to spend the night in Torrington, which is 3 hours south of Devils Tower. The unpaved road journey was very scenic. We are glad that we took that route. 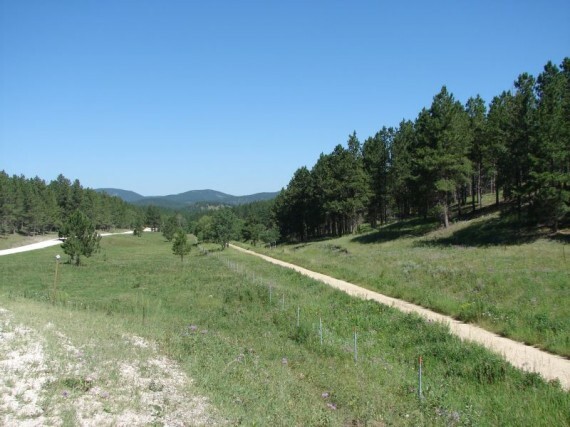 There is an old railroad line that went the length, north to south pretty much, through the Black Hills. They have turned it into a walking/biking trail called the Mickelson Trail. Our road ran alongside this trail for most of the time. It is fairly level terrain, as it was an old train track, but you’re still in the hills, so there is some elevation change. We saw lots of bicyclers along the route, but not many other cars. There is one town, called Mystic, that we passed through on this gravel road. This town is actually on the South Dakota map, despite the fact that this “town” consisted of one house and 2 other buildings. We emerged from our backroads adventure a little south of Lead and Deadwood. We didn’t stop in either town, but Deadwood looked like you could spend a couple of days there looking at the historic buildings, and touring the old gold mine. Up the road a few miles we found Sturgis, home of the famous Motorcycle Rally. I am sure it is a nice town, but really did not see anything special that differentiated it from a 100 other similar towns we would have passed through on this trip. We decided to have lunch there, at a place called Rosco’s Steakhouse. The fellow who owns it, raises his own beef outside of town, which is pretty cool. However, we noticed they had Buffalo Burgers and since we had no idea how that would taste (heavy sarcasm intended), we ordered that. These were the best Buffalo Burgers we’ve had on the trip, so we’re glad we did. The kids were so well-behaved in this restaurant. At one point, the two girls were chanting some type of Girl Power slogan, and Miles began shushing them. I heard him tell them that this is not a “normal” restaurant – that it is for adult bikers, so they better be quiet. Actually, before we found Rosco’s, we drove down Main Street, which will be filled with thousands of bikes in about 3 weeks, and went into one of the t-shirt shops. Miles got himself a Sturgis Bike Rally t-shirt, and it is the shirt that won “Best Design” for the 2006 rally. It is very cool, so be sure to ask him about it when you see him. After Sturgis, we drove up to Belle Fourche, South Dakota, which is perhaps 30 miles away. 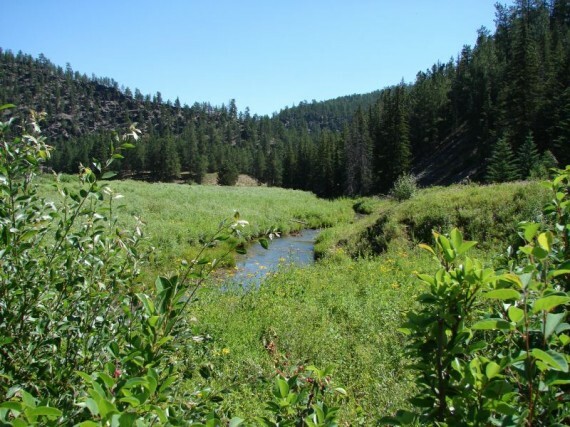 Belle Fourche is not on the beaten path, so you have to want to get there, in order to find yourself there. We were surprised that we were not seeing any signs providing us directions on how to get to the Center of the US. 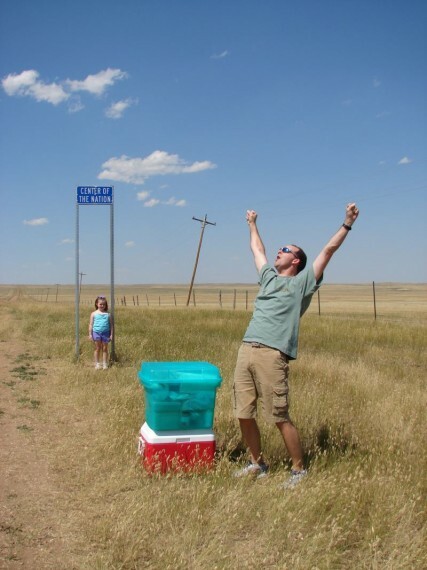 We drove all the way down the main drag without a single sign, and then there it was – the Geographic Center of the US Visitor Center! We all pile out, thinking this is it. We go inside and I ask the lady at the Information Desk how I could find the Center of the US. She told me, and I am not making this up, “It’s not really much to see, and it is 20 miles from here, if you even want to go do that.” What?! This is not the kind of family who will sit idly by and get our picture taken at the Visitor Center! So, I had her explain to me how to get there. She showed me a little map, and explained how you had to drive 13 miles north of town on the highway, and then take an unpaved road for 8 miles. She also told me there were no signs on the road telling me this, and we later realized this woman was full of crap. So, we did drive the additional 20 miles, and while driving the 8 miles on the gravel road, we met exactly one car, and he gave me the most enthusiastic wave I have ever received on a gravel road – and I grew up on gravel roads! In hindsight, I realize he was just glad he was not the only crazy person out there. Out in literally, the middle of nowhere on a gravel road in northwest South Dakota, is a blue highway sign that says, “Center of the Nation” The actual center is on private property, so we had to climb through a barb wire fence, and walk through a cactus-infested pasture about 150 feet to the marker. The marker is probably about twice the size of a silver dollar, planted in a small concrete slab. According to my travel plans, it was supposed to take an hour and a half, to get from Custer to Belle Fourche, but we have already spent 5 hours by this time, it’s 3:00, and we’re nowhere near Devils Tower! We drove the 20 miles back to Belle Fourche and sneered at the Visitors Center as we went past, then caught Highway 34 west to Wyoming. The landscape changes dramatically as you move from South Dakota to Wyoming. There is actually a small part of the Black Hills National Forest in Wyoming that we passed through. It was very nice. 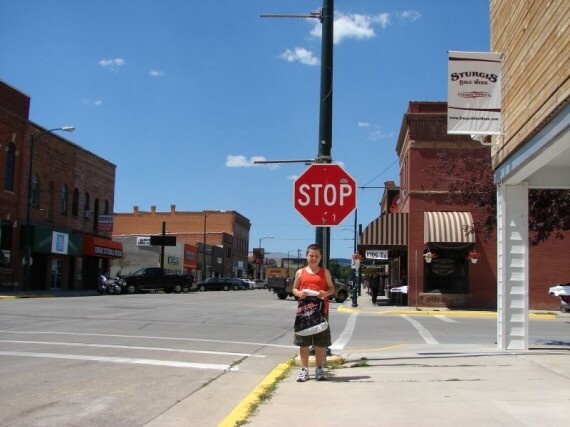 We had read about a General Store in the town of Aladdin, Wyoming, (Population 15) that had been in operation for 110 years, so we felt we had to stop. We pulled up to the front, not even sure if it was open, but we all climbed out and went inside. 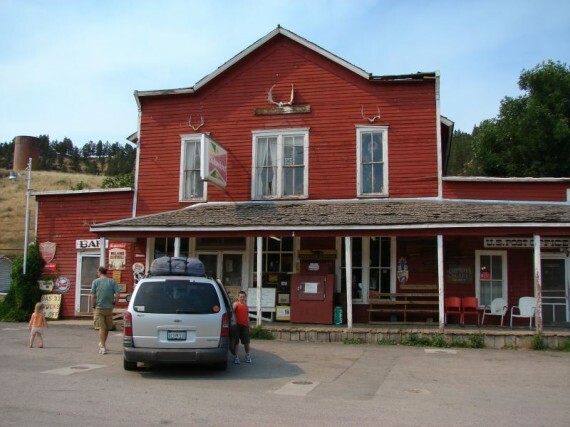 It is an old rustic store that sells quite a bit of Aladdin Wyoming gear, as well as Cowboy and Cowgirl gear. Oh, and they also sell all kinds of junk. This store was two stories, and was essentially an old dwelling on the 2nd floor. We must have spent a half hour in this store. Miles had to go to the bathroom and was directed to the outhouse next to the store. Sure enough, this place had a Mens and Womens outhouse. And for whatever dreadful reason, both of the boys had to “visit” the outhouse. By the time we left the Aladdin General Store, there must have been 7 cars out front. We liked to think that we started something there. 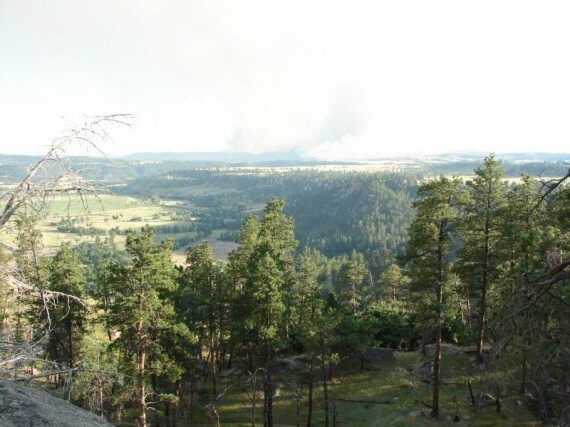 As we traveled on, there was a very pretty haze nestled in the valleys as we drove up and down the Black Hills, and as we turned one corner – there it was, Devils Tower off in the distance. 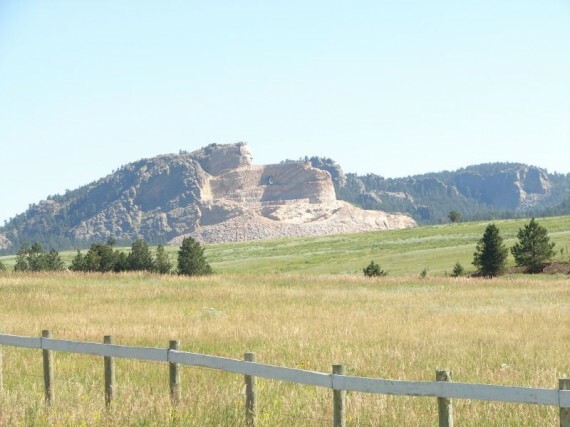 There are a few very small towns between Aladdin and Devils Tower, but there was no cell signal, and we had decided to cancel our hotel reservations in Torrington, because we did not want to be driving until midnight. We stopped at a motel in Hulett, which is 10 miles north of Devils Tower. I asked about rooms, and she said she was sold out, because of the Forest Fire. What Forest Fire is this? There was a large Forest Fire south of Devils Tower, and she had a lot of firefighters staying in her motel. Additionally, she told me that the road was closed south of Devils Tower. By this time, we’re getting a little anxious because we have less than an hour to cancel our reservation in Torrington, and when you try to dial a number on the cell phone, we are presented a message “Emergency Use Only”. So, I found a pay phone in front of the Tower Valley Ag Supply Store in Hulett, but it doesn’t work. I ask the lady inside if there is another pay phone in town, but she says that is the only one. I explained my situation, and she said, “Well, let’s just use this phone, it’s not like you’re going to be talking for an hour”. I like these folks in Wyoming. So, I used the store phone to make a long distance call, and got my reservations cancelled. We drove on to Devils Tower, and right at the base of the Tower, directly outside the National Monument sign, is a KOA campgrounds. On a whim, we decide to send Stephanie inside to see if they have any cabins available. She was in there a long time, and when she came out, she was carrying a key! She had got the last cabin, Cabin #1, so we were staying the night at Devils Tower! When you are standing on our porch, you are looking directly at the tower. It is an awesome sight. The view of Devils Tower from our cabin! We unloaded our gear, and got up to the Visitors Center, which was only open for another hour. The kids started their Junior Ranger activities, but didn’t quite get through with them by 7:00 closing time. However, with the chance that the Visitors Center may be closed the next day due to the Forest Fire, they went ahead and gave the kids their badges, which was very cool. The first thing that we noticed when looking up at the tower, is that it has a green tint to it. I was expecting it to be brown. The green tint is due to the lichen growing on the rock. Next, we went for a 1.3 mile hike around the tower. It is very impressive up close. There are several scientific theories (for the time being, let’s exclude the Indian theory of the Giant Bear) for how Devils Tower was formed. The one that is easiest for me to understand is that it was magma which cooled inside a volcano millions of years ago. This formation used to be 1.5 miles beneath the surface of the earth, but everything else has eroded around it. As a matter of fact, the formation itself used to be considerably larger than it is today. Devils Tower is our country’s first National Monument, and it is celebrating its 100 year anniversary this year. Like Carhenge, in Alliance Nebraska, it was recently featured in USA Weekend magazine as one of the top 10 “Out of the way places you should go out of your way to see”. We were very disappointed with the Visitors Center, after the places we have visited so far on this trip. It is actually a large wooden cabin, built by the CCC back in the 1930s. We got back down from Devils Tower (and the neighboring souvenir shop) about 9:00, and then we hit the pool. The kids had not got to swim since Day 2 of our trip, and we were starting to hear about it! The water was wonderful. As luck would have it, we were the only ones in the pool. As it got darker, the stars started to come out, and you could make out Devils Tower through the trees. We had a wonderful time. By the way, Marissa is starting to become a little daredevil. We have her in a life jacket, since she cannot swim, but she will just jump off the side all by herself and splash around. She has gotten a lot more comfortable with the water on this trip. We shut the pool down at 10:00, then came back to the cabin for dinner. Yes, dinner at 10:00 (11:00 Oklahoma time) – we are on Vacation!! We ate dinner in our lawn chairs in front of the cabin with a sky full of stars and the silhouette of Devils Tower directly in front of us. The kids loved it. After dinner, we put the kids in bed, and then Stephanie and I got to enjoy a few minutes out in the lawn chairs looking at the stars. Even though there was a forest fire about 10 miles away, the smoke was blowing a different direction, and there was not a cloud in the sky. It was perfect viewing weather. We could see the Milky Way. We saw a shooting star, and we saw several satellites floating through the sky. I could have stayed out there all night, but we did not pack any long pants, and it gets cold in Wyoming at night! Even though today’s events did not go as planned, we are trying to keep flexible, and we think that this experience has worked out for the best. 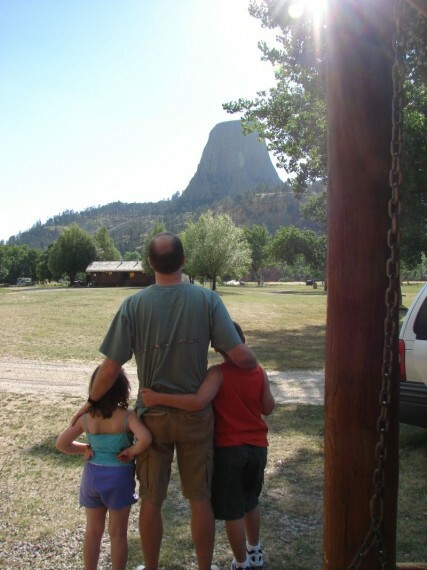 You don’t get to spend the night at the foot of Devils Tower every day! We hope that the roads get reopened to the south so that we do not have to do any significant amount of backtracking. Writers Note: I am writing this entry on Saturday morning, sitting in my lawn chair, looking at Devils Tower. It doesn’t get any better than this! 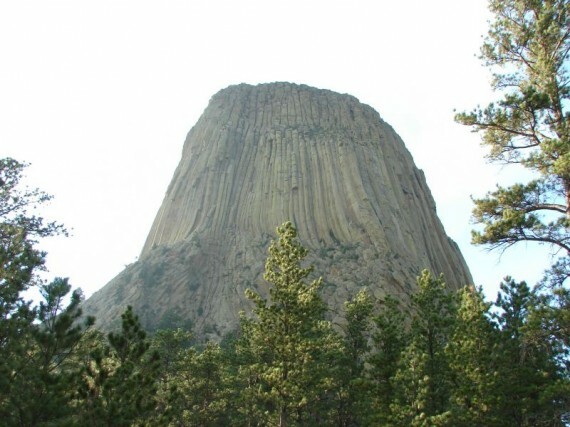 Earlier this summer, I rented the movie Close Encounters of the Third Kind, which features an Alien Landing at Devils Tower. This got the kids pumped for this experience. Coincidentally, every night at 9:00 at the KOA campground, they show the same movie – Close Encounters! 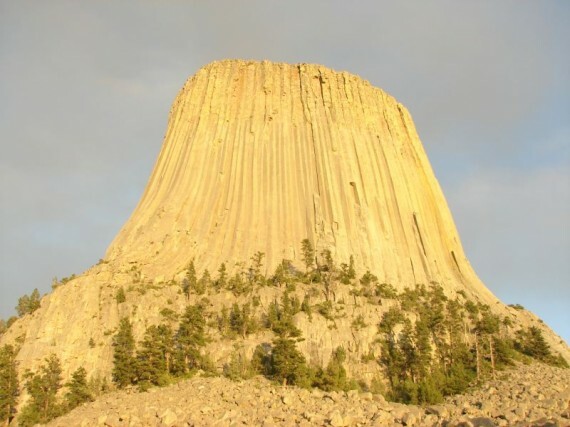 If we were here for two nights, we would have definitely arranged our plans so that we could watch this movie at the base of Devils Tower. The cabin we are staying in has a full size bed and a bunk bed. They do have mattresses, but no sheets or pillows. However, we make our own luck, and we were able to locate 3 pillows, 2 sheets, and a blanket in the van, which made the overnight stay a lot more enjoyable than sleeping on a vinyl mattress. Thank you Stephanie, for being prepared!